This is the complete guide to help you choose the Best Sunrise Simulator Alarm Clock Of 2018. 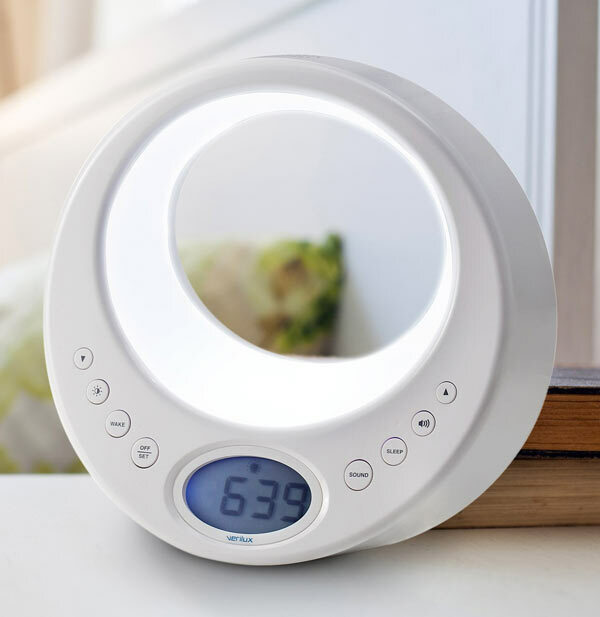 If you are looking for something to lull you into sleep in the evening and then rouse you gently from your slumber in the morning take a look through my round-up of the best sunrise alarm clocks and find something that could make your days (and mornings!) a lot more bearable. A quick view of my 12 favorite Sunrise Simulator Alarm Clocks of the year. Why Get A Sunrise Simulator Alarm Clock? A few reasons why a Sunrise Simulator Alarm Clock might help you. Some practical hints and tips on choosing a Sunrise Simulator Alarm Clock. In-depth reviews of my 12 favourite Sunrise Simulator Alarm Clocks of the year. Do you really enjoy being shocked awake from a deep sleep by the shrill sound of an alarm clock ringing? I don’t think any of us do. Sunrise Simulator Alarm Clocks, or wake-up lights as they are also known, rouse you gently from your sleep without the need for an alarm sound. They use light to wake you up, replicating the natural way we used to wake. The light will start off low and gradually increase to full brightness and somewhere along the way you should wake up. Some also have an additional alarm or sound you can have playing at the end of the sunrise cycle just to make extra sure you wake up. By simulating a sunrise wake-up lights can effectively reset your circardian rhythm and help you get a balanced 7 to 9 hours sleep a night. Your circadian rhythm is in effect your internal body clock. In the winter, when we have less hours of sun our bodies produce more melatonin – a hormone that makes us sleepy. Often during winter months we may feel ‘groggy’ for the first few hours of the day as a result of this excessive production of melatonin. Wake up lights can help produce serotonin, another hormone that regulates feelings of well-being to the point it is know as the happiness hormone. By helping increase the production of serotonin and reduce the production of melatonin sunrise simulation alarm clocks can help you sleep better and wake up feeling refreshed and ready to start the day. A study by Chronobiology International showed that being startled from a deep sleep by the piercing sounding of an alarm leds to higher levels of cortisol, increased stress, worse moods and inertia. Another study by Psychoneuroendocrinology on a range of volunteers showed that those waking up with sunrise alarm clocks felt more awake and had increased alertness througth the day, amongst other things. There are many more studies that show the benefit of using a sunrise simulator alarm clock. Acta Psychiatry carried out a study showing wake-up lights increased mood, productivity, quality of sleep and more. The Journal of Affective Disorders carried out a study that showed that SAD suffers showed a huge improvement in terms of waking up in the morning and feeling less sleepy throughout the day after just a week of using a sunrise simulator alarm clock. It is a much nicer way to wake up than to a piercing alarm. Many have other functions such as a sunset simulation to help you wind down in the evening. They are proven to have a positive effect on your mood and energy levels during the day. As with making any purchase when you choose a sunrise simulator alarm clock there are a number of factors you will need to consider. Of course when you buy a wake-up light you buy it primarily for one reason – the sunrise simulation. Take a look at what colors make up the sunrise simulation. Some use just yellow and white, others use a mixture of red, oranges and yellows. Also consider the type of bulb the device uses. I always think LED bulbs produce a more realistic sunrise simulation than halogen bulbs. LED bulbs are also more energy efficient, last longer and give off less heat then halogen bulbs. Most new units use LED bulbs. The best sunrise alarm clocks have a whole host of adjustable features. You will be able to adjust the brightness level you want the sunrise to reach in the morning, adjust the duration of the sunrise, adjust the volume of any sounds you want to wake up to and more. Think about how you intend to use it and the level of functionality you want. Some sunrise alarm clocks allow you to be woken up by, or go to sleep with nature sounds to compliment the sunrise. These can be an extra nice way to rouse you from your sleep and also give you a little confidence that you will definitely wake up with the extra sound. I find the sound of birds tweeting or ocean waves much nicer that a beeping alarm as well! Some sunrise alarm clocks also come with FM radio. Some sunrise alarm clocks allow you to schedule more than one alarm – perfect if you get up at a different time in the week compared to the weekend for instance. I don’t know if you are like me, but I hate any kind of ambient light when I am trying to sleep and there is nothing more annoying that buying an alarm clock, congratulating yourself on how great it looks and how easy it is to work, only to find out when you turn off all of your lights the time display is brighter than the light itself! Check to see if the time display can be dimmed, or even better turned off completely. Nearly all sunrise alarm clocks will have a sunset feature as well. That means you can gradually be lulled to sleep by a slowly dimming light if you have trouble getting to sleep. You might also want to consider other factors such as how easy it is to programme, whether it has a battery back up and the size and weight of it. 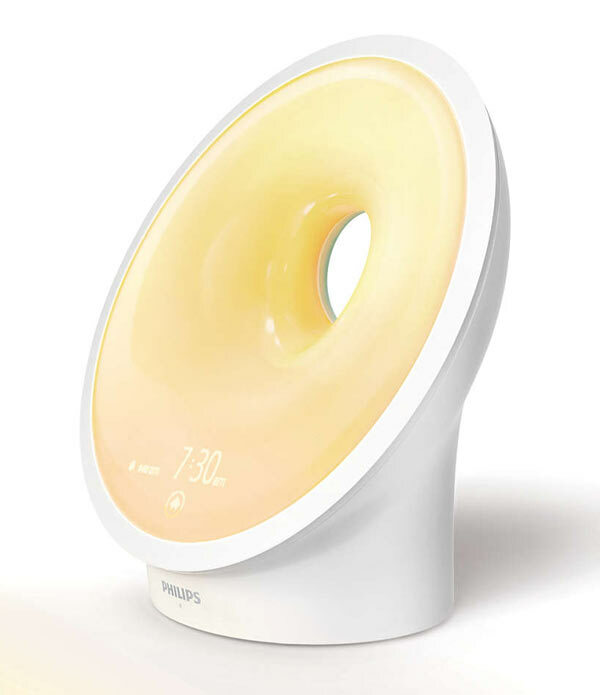 The Philips Somneo HF3650/60 is the latest wake-up light by Philips and it really does take things on to another level with an innovative light-guided breathing system to help you sleep as well as a fantastic sunrise simulation. This has 25 brightness settings and reaches a maximum lux level of 320 lux. There are seven nature sounds you can wake up to and an FM radio. The sunrise and sunset duration is fully adjustable, it weighs 2lbs and comes with a two-year warranty. It has two alarms, a USB charging point and a battery backup. Where this really pushes the boundaries is it is the first wake-up light to feature ‘RelaxBreathe’, Philips own light and sound-guided wind down function to help you sleep. It plays out rhythms of light and sound which you have to follow with your breathing to calm you and help you move from the busyness of a day at work to a nice relaxed sleep. It actually seems to work and is a great way to drift off to sleep if that is something you have trouble with. A beautiful sunrise feature that moves from a lovely soft morning red to a warm orange through to a bright yellow to wake you up. Finally Philips have got the message and you can fully turn off the clock display on this! It has a great feature to use if you are prone to waking up in the middle of the night to use the bathroom. Just tape the snooze button and you get a very faint glow – enough to help you find your way, but not so much it hurts your eyes. Everything is sleekly and smartly designed – there is a wonderful touchscreen and intuitive press button functionality. It is just very nice indeed. Two main issues. One turning the alarm on and off (aside from at alarm time) is not that easy. You have to flick through the touchscreen menu and scroll through options until you get to the right location – it could be easier. The price is high. It is the most expensive wake-up light on this list, but with good reason – it does offer more than any of its competitors. This is the Rolls Royce of wake-up lights, the sunrise simulation is beautiful, you can turn the clock display off and I love the guided breathing exercises to help you sleep. It is top class. Those looking for a beautiful sunrise simulation. 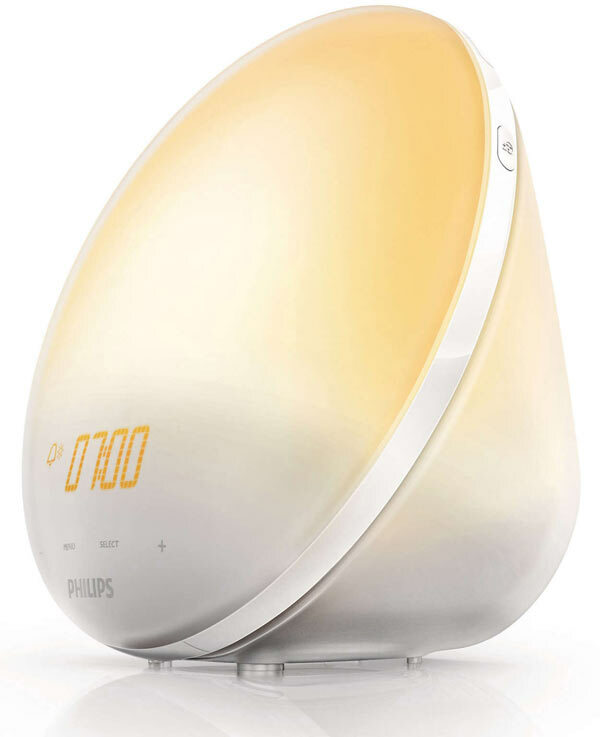 If you are looking for a sunrise alarm clock with a a beautiful sunrise simulation then the Philips HF3520 is very hard to beat. 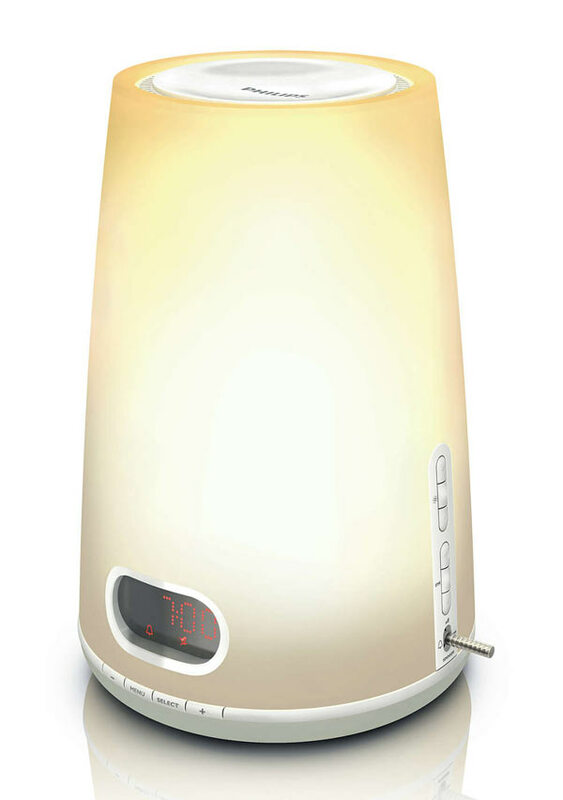 It has ten adjustable light intensities and also five natural sounds you can wake up to. The sunrise duration can be set to anything between 20 and 40 minutes and it has a maximum light intensity of 300 lux. It has two programmable alarms, an FM radio and the clock face has four brightness settings and also adjusts automatically to ambient light. If you want to use this as a reading lamp it has 20 brightness settings. This does have an absolutely gorgeous sunrise. The light progresses from a red tinge to a nice warm orange glow to pure yellow and then white. It is genuinely nice to wake up to and does as perfect job of recreating a rising sun. You can complement the rising sun with five natural sounds – gentle piano, garden noises, birds in the forest, rainstorm with gulls and a bird song. A nice feature to help rouse you from your slumber. The time display is great. You can adjust to brightness of it and it has a sensor so it dims when all the lights in the room are off for instance. It has two alarms – if you have a different wake up time during the week compared to the weekend for instance (as most of us do) – a nice function that not all alarm clocks have. It has a nice dusk simulation – the lighting dimming slowly and consistently. It looks amazing! Futuristic, smooth, sleek and very good indeed. Philips could have done better when it comes to the buttons for this – they are all around the rim of the light and are small and hard to read. Also setting the time and setting the alarms is not as easy as it should be – it gets confusing and takes longer than it should do. But this will ultimately be judged on the quality of its wake-up light and that is very, very good indeed and it is easy to see why this remains at the top of the best sellers list. Those wanting a great sunrise and sunset simulation. Another in the range of Philips Wake-Up Lights and another winner – the Philips HF3510 is when Philips really took things up a notch. It has 20 brightness settings and a dusk simulation as well. You can wake up to three nature sounds and the digital clock has four brightness settings. There is one alarm, an FM radio and it weighs 1.8 pounds and has a two-year warranty. This is the first in the range of Philips wake-up lights to give off 300 lux of light (previous models were 200 lux). You notice the depth of color in the light – it slowly changes from orange to yellow, using nicely diffused LED bulbs and give a glorious imitation of the sunrise. You can wake up to three nature sounds with this – birds chirping, piano music and birds chirping with music. The sounds are really nice and not repetitive. It offers a great sunset simulation which you can set to last from 5 to 60 minutes. It is almost as nice as the sunrise simulation. As is common with Philips products this has a really gorgeous sleek, stylish look. You can control the lamp brightness independently from the wake-up light brightness. Ie if you want to read before you go to bed you could set it at level 18, but if you want the light to only reach level 15 in morning you can set both of these. Therefore it works well as a bedside lamp. It uses LED bulbs which last longer, stay cooler and are more energy efficient. Again the control buttons are right round the rim of the clock and are small and hard to identify in the darkness. Also the time display cannot be turned off completely, the lowest setting is very dim but if you are the kind of person who does not like any ambient light at all it may still annoy you. This however was a big step forward in the Philips Wake-Up Light line. The sunrise simulation is fantastic – you get lovely nature sounds to wake up to and it looks great. Well done Philips! Those looking for a uniquely designed wake-up light. The Philips HF3470 is one of the earlier models of the Philips Wake-Up Lights range and is now very difficult to get hold of, which is a shame as it is a damn good light. It has 20 brightness settings and a maximum light intensity of 250 lux. It has one alarm and three alarm sounds (birds chirping, wind chimes and an FM Radio). The time display has four brightness settings, weighs 3.2lbs and comes with a two year warranty. The HF3470 is quite unique in its design amongst the Philips Wake-Up Lights that are on the market. After this they seemed to take a different direction – their proceeding wake-up lights were circular, whereas this is much taller and looks more like a speaker or even a vase. Nonetheless I think it is very stylish and looks modern and the larger surface area gives off much more light which is a good thing. The light itself is really warm and buttery. Unlike most modern lights it uses a halogen bulb, but it is a very pleasant light indeed. When the light reaches full intensity, the nature sounds or FM radio will come on and gradually increase over 90 seconds. The increase in volume is smooth and gentle and works well. The two nature sounds themselves are great and of a high quality (birds chirping and bells chiming). It is easy to use and the controls are actually better than on the later Philips Wake-Up Light Models. Nice and customizable – set the light level, the maximum volume you want the alarm to reach and the alarm sound. On the downside this is so now difficult to find as it is out of production, and when you do it is generally very expensive. Also the large surface area is great in many ways, but this does give off a lot of heat and you have to be careful not to accidentally touch it when the light is at full blast. It is a shame this is so difficult to find as it is a great sunrise simulator alarm clock. If you do find it and at a reasonable price, you must snap it up! Those wanting some nice and natural wake up sounds. The Philips Wake-Up Lights get better and better as the product progresses and although the Philips HF3505 is nearer the beginning of that line it still has some very compelling features. It has ten adjustable brightness settings and you can wake up to one of two nature sounds or an FM radio. The maximum light intensity is 200 lux. It has a time display with four brightness settings, weighs 0.6lbs and has a two year warranty. I love the two nature sounds that you can set to play after your wake up light has reached full strength. They are birds chirping and a rainforest like sound with a mixture of birds chirping and frogs ribbiting. The sound kicks in slowly but steadily. Building up from nothing to your chosen volume level (1 to 10) in a consistent manner and within 90 seconds. They are relaxing and authentic. 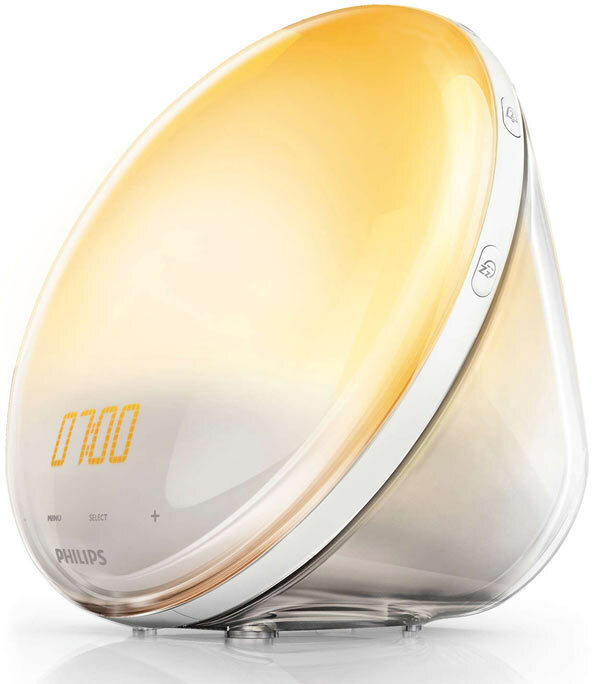 In keeping with all the Philips models it has a lovely sunrise simulation and although it only uses yellow it is a refreshing light that is nice to watch go from mild to bright yellow over a 30 minute period. All the Philips Wake Up Lights look great and this is no exception – very impressive looking piece of kit. It is simple and intuitive to set the time and the alarm. It has a lovely touchscreen functionality that fits in with the futuristic looking design and works nicely. My main problem with this is that when you are woken from your sleep by the light you can only turn it off by touching a small sensor immediately below this blinding light! It is difficult to find, invariably you are staring into the light and it hurts your eyes. The snooze button is not great either. You have to tap it quite strongly to get the light to snooze, but as the light is so lightweight you can easily end up pushing it across the table as you tap snooze! But these are minor things. This isn’t the best Philips Wake Up Light out there but it certainly is a good one and does its main job really well with a very nice sunset simulation. Those wanting a truly soothing sunset simulation. Verilux are more well known for their forays into the SAD light market, but the Verilux Rise and Shine Alarm Clock is a truly customisable sunrise alarm clock. It has 15 brightness levels and a maximum of 454 lux. It has a time adjustable sunrise and sunset simulator which can be set to just white light or a range of colors. It has six sounds you can use as an alarm and an FM radio. It weighs 1.6lbs and comes with a year warranty. As mentioned this is very customizable. The Sunrise can be set to 15 or 30 minute duration and the sunset to 5, 15 or 30 minutes. You can choose nature sounds to go to sleep to or wake up to or even nature sounds playing over the FM radio! With the sunset simulation you can also set it to rotate through 250 soothing colors to help lull you to sleep. You can also program the light intensity as well to suit your needs. The sunset simulation works really well – especially the ability to set it to rotate through the 250 colors of light – it is truly relaxing and effective. This initially started out at a high price point, but now it can be found at a fraction of the cost and is really good value for money. Lovely and unusual design – like a cross between a UFO and a frisbee! It has a nice snooze sensor that is a non-button touch activated area at the top of the device. It works well to snooze the light during the sunrise cycle and also to turn it on and off. The fact is touch activated is a nice feature as it makes the process simple and infallible even in a sleepy state! The sounds, which include ocean waves, a babbling brook and birds are really nice and very soothing. This does use LEDs that feel slightly cheap as they flicker slightly when the voltage varies as the lights change colors. The clock display is quite bright. It has two brightness settings, but can’t be turned off, which I find very annoying as I like my bedroom to be pitch black. 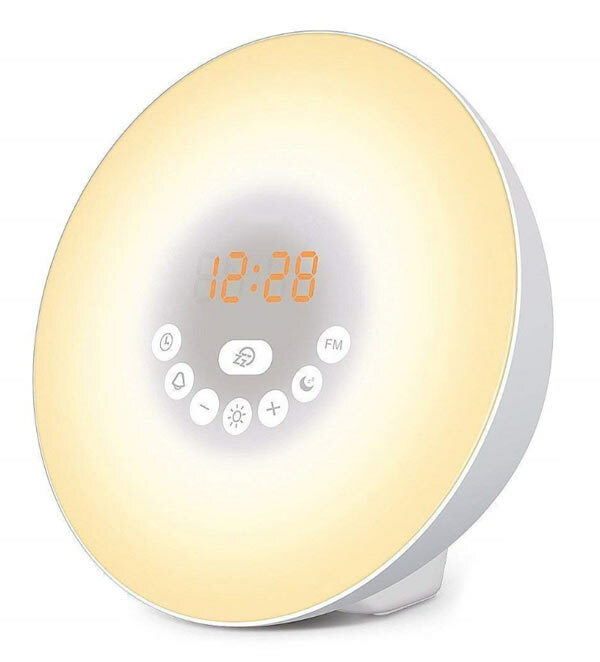 Overall this is a really nice sunrise alarm clock that looks different, has a huge number of customisable options, a lovely sunset feature and is at really good price now. Well worth a look. Those wanting no ambient light from a time display. 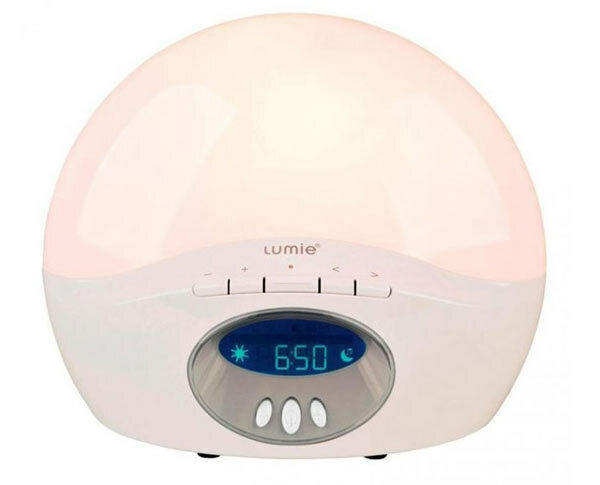 Alongside Philips the other big player in the wake-up light/sunrise alarm clock market is Lumie. The Lumie BodyClock Active 250 actually has a couple of big advantages over the Philips models it competes against. It has a sunrise and sunset simulation that can be set over a period of 15 to 90 minutes. It also has six different alarm sounds you can wake to – five nature sounds and FM radio. It has a dimmable time display, weighs 2.2lbs and has a one year warranty. Now the big advantage this has for me over the Philips models is that the clock display can be completely turned off. If you are like me and dislike even the smallest amount of ambient light at night this is a big bonus. If you want to check the time at any point, just press one button and the time will flash up for a few seconds and then turn off completely again. It has a battery backup – another advantage over the Philips models. So if there is a power cut it will keep the time and any settings and the alarm will still sound. I like the fact that the clock remembers all of your settings anyway. So once you set your alarm, everything like noises, times, brightness settings are automatically saved. It is very customizable – the sunrise and sunset features can be set to anything between 15 minutes and 90 minutes. Then you have many other settings for the lights and sounds. Talking of sounds you get five nature sounds – morning chorus, waves, rooster, white noise, beep and FM radio – to wake up to and they build slowly and consistently. You can also set the sounds to fade slowly if you are using the sunset feature. The light is nice, going from a soft orange to a more intense white smoothly and naturally. You will notice that this actually gets very hot as it uses incandescent halogen bulbs. Be careful as the plastic casing will warm considerably. Also be aware that generally this is more costly than most of the Philips Wake-Up lights. But overall the ability to turn the time display of completely and the battery backup might make you decide to choose this above the Philips lights and if you do I certainly don’t think you will be disappointed. If you don’t want to pay out a lot of money but still want a reasonable sunrise simulation then head towards the instecho Sunrise Alarm Clock. This has ten adjustable brightness levels and the sunrise simulation can be adjusted also from 20 to 40 minutes. It also has a time display you can adjust the brightness of. It comes with six nature sounds and FM radio you can wake up to, weighs 1.1lbs and comes with a two-year warranty. I am actually reasonably surprised by how good a job this does of simulating sunrise – it progresses from a yellowish color to a yellowy orangish color, smoothly and seamlessly with no jumps. You can also adjust the sunrise duration from 20 minutes to 40 minutes and the full brightness it reaches between 1 and 10. It is nice to have such adjustability in a budget level sunrise alarm clock. The LED clock is great and adjustable and actually doesn’t disturb you that much – usually I am super sensitive to them but this one is good! The nature sounds are nice – they are piano music, birds, forest noise, waves, beeping and the sea. One problem is the buttons. They are small, close together and difficult to press and it makes setting the time and alarms very difficult. Also this does feel very flimsy and plasticky, you can tell a few corners have been cut in the production of it. However that is not surprising when you consider the price! And it does give a lovely sunrise simulation, which I guess is what you would buy it for! Another budget option wake up light that sets itself apart from the field with a particularly sleek design is the VegasDoggy Sunrise Alarm Clock. This has a 30 minute sunrise simulation and ten brightness levels. It has six sounds and an FM radio that can act as an alarm. It also has a USB power port, weighs 1lb and comes with a two-year warranty. For a budget option this does have a nice design. It has buttons around the rim which are labelled clearly and easy to understand. The alarm and time is easy and quick to set as well. It has a classy touch screen exterior, a large LED timescreen, looks modern and doesn’t appear like a budget option if someone were to see it on display. It has two separate alarms – again quite rare on a budget wake up light and a good option if you have two wake up times, one for weekdays and one for weekends, as most of us do. The FM Radio is great actually and it can store 21 channels, which is a nice extra. This can also be used as a mood light – the light can solely emit one of seven colors – white, green, red, blue, purple, orange and indigo – nice and relaxing. You can charge this via USB – another option you don’t often see on budget wake-up lights. It is compact and doesn’t take up a lot of space. I found even the lowest setting on the alarm to be quite loud – I didn’t even want to try the highest setting! Also the touchscreen buttons look great, but are somewhat unresponsive and it can be quite annoying using them when you want to instantly turn off the light and it takes five attempts to do so. Nonetheless for its nice design alone this is worth considering. The sunrise simulation is pretty good for the budget price and it has some other nice features you wouldn’t expect on such a budget. Those looking for the best value for money. 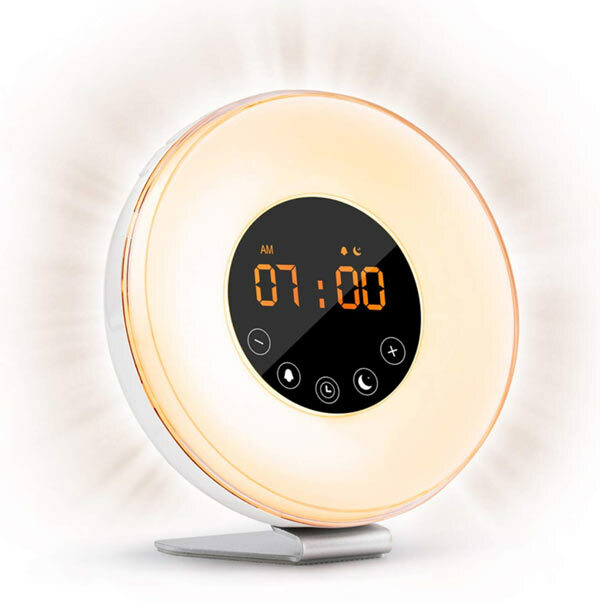 The hOmeLabs Sunrise Alarm Clock is one of the most popular sunrise alarm clocks out there – combining ease of use, a nice sunrise and sunset and a few other features. This has an adjustable sunrise and sunset feature from 15 minutes to 60 minutes and ten brightness levels. It can also be used as an atmosphere light and set to one of six colours. It has six nature sounds and an FM radio, weighs 1.3lbs and has a two year warranty. It also has a battery back up and is USB chargeable. This is exactly what a budget product should be – it is reliable and has no bells and whistles but does its job well. The sunrise and sunset features work well – the increase of brightness is gradual but steady and it can be set to 15, 30 or 60 minutes. Overall for a budget price it does this really well. You can shut the time display off completely so you can sleep in the pitch black – always a big plus for me and better than some of the more expensive Philips models. Doubles up as an atmosphere lamp – you can set it to specific colors (red, green, orange, indigo and purple) or a rotating mixture of them to create a relaxing mood in your room. There are a variety of power options – mains power, usb or battery – making it easier to keep it running. I love the non-slip aluminium feet which keep this stable on your bedside table, it also is pretty compact so doesn’t take up much room. It is the cheapest on my list I think – great value for money! The glass touch-buttons this has are difficult to press and unresponsive to the point it can get very annoying and makes it difficult to set the alarm. This has six nature sounds you can wake up to as well, but to be honest they aren’t great. They are on a very limited loop and the speaker is tinny so they don’t sound great. But as I say this is very cheap and you really aren’t losing much if you decide to give it ago – on the whole it does its job very well and you won’t be disappointed. Those looking for a lovely mood light. There are a number of cheaper, more basic sunrise alarm clocks that still do a good job and the Sokos Sunrise Alarm Clock is one of them. 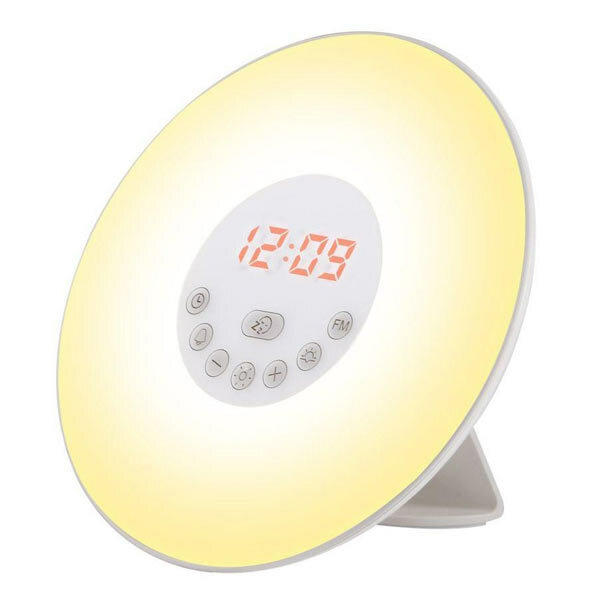 Its wake up light has ten brightness levels and the light itself is adjustable to one of seven different colors. It has six nature sounds that can be selected to act as an alarm, which play for two minutes at alarm time. It has a sunset simulation, a rechargeable battery, weighs 1.25lbs and has a two-year warranty. This is as much a mood light as a wake-up light really. It has seven colors you can select that it can emit to help relax you. You can choose from warm white, green, red, blue, purple, indigo and orange to create your own atmosphere at home. It also has ten levels of light brightness you can select from so you can use it as a bedside lamp. It has a good 1800mAH rechargeable battery with reasonable capacity. It actually doubles up as a charger for iPhone X, iPhone 8 and any other mobile that has wireless charging functionality. It has really nice touch keys that are easy to use and make it very easy to set the alarm, the time, light levels and so on. It has a nice big clear, but not too bright LED display that is so easy to read. The price is really good – it is a budget option. On the downside this has a short wake up time – it illuminates over a 15 minute period which you can’t change, so it is a bit too rapid for a really nice and gentle rousing from your sleep. Also the sunrise simulation is nice, but you can see this is more of a budget option as it isn’t so realistic or smooth as its more expensive competitors. Nonetheless if you aren’t too fussed about these things and can live with the slight inadequacies in the sunrise simulation this is a great budget choice! Those wanting great customer service. 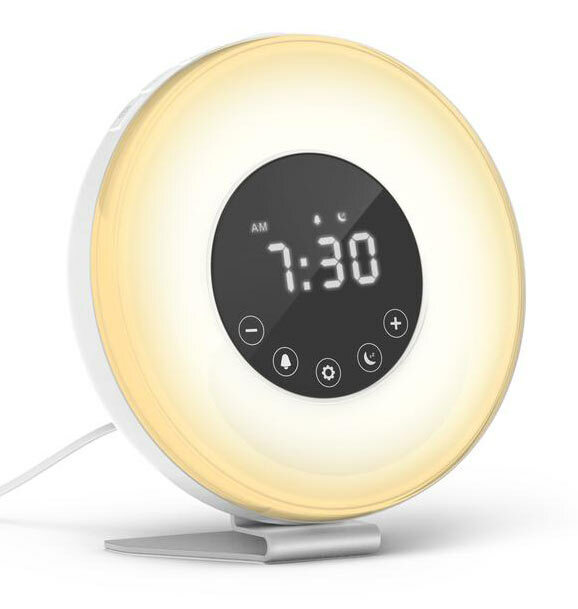 The Totobay Wake Up Light is another budget sunrise alarm clock with a lot going for it, but what really sticks out is their fantastic customer service! It has ten adjustable brightness levels, a sunrise and sunset feature and you can wake to one of six nature sounds or FM radio. It is powered by mains, USB and has a battery back up, weighs 0.65lbs and has a two-year warranty. If only every company had the same customer service standards as Totobay! You will see lots of positive feedback on how easy they are to work with and how proactive they are in offering refunds or solutions to problems. That is not to say you should get too many problems with this sunrise alarm clock as all in all it is a pretty good piece of kit. The volume control does seem limited on this though. Even at the lowest sound it is too loud! And the backlight on this makes the buttons hard to see – even more so when the light is shining in your face. This could be improved. It is a good budget wake-up light though and the fact Totobay have such a great reputation for customer service is a big bonus. I hope you have found this rundown of the Best Sunrise Simulator Alarm Clocks of 2018 of use and there is something on this list to suit your needs. If you do have any questions or are uncertain about anything then please just drop me an email and I will do my best to help. Don’t forget you can also look at my Wake Up Light Reviews Index for an overview of all my wake up light reviews on one page. These sunrise simulator alarms are pretty cool and definitely something I would get for myself or my family. I’ve been wondering what to get my brother this Christmas and this looks like the perfect gift. I especially like the design of the Verilux Rise and Shine, and the ones that have the nature sounds is great for people living in the city but would like to be closer to nature at the same time. Since these alarm clocks causes you to produce seratonin, does that mean even if you sleep let’s say 5-6 hours a day you can still wake up refreshed? Hi Kent – I agree the sunrise simulators are pretty cool! I love the look of most of them and most of them work really well too. The Verilux Rise and Shine has quite a different design to the others on the list – it is pretty eye catching. But my favourite is the Philips Somneo HF3650 – it just works so well. I never thought there could be an alarm clock or device like this. This is exactly what I’m looking for. My kids have problem waking up early for class. They are so dead tired with their projects that they can’t wake up on time. Out of the reviews you made, I prefer the Totobay wake up light, USB and battery powered. Thanks for your review, I now know what to buy. Again, thanks. You are welcome Eli – I bet your kids will love it – you might even be tempted to buy one for yourself! Any other questions just let me know. Thanks for that very interesting article. I must admit, I didn’t know there was such a wide range of Sunrise Simulator alarm clocks available. I will certainly be investing in one of those, they seem like a much better way to wake up than being jolted into the day by a buzzer. I also was unaware of Seasonal Affective Disorder, but after reading a bit about it on your other posts, I think I suffer from it a bit, I thought it was just cold winter mornings that were to blame. I’ll certainly be bookmarking your website for more reading, you have a lot of useful information, thanks for enlightening me. Thanks Greg. Lots of people don’t realise that when they are feeling a bit low in the winter it could be more than just the winter blues. Sunrise Simulator Alarm Clocks are remarkable things – I wouldn’t be without mine now and it makes waking up early a much more pleasant experience. Please check back on my website every now and then and if you do have any questions just give me a shout. This is by far the best site I have found for learning about how the Sunrise Alarm Clocks work. You have laid out all the options and comparisons so that it is easy for me to find the perfect sunrise clock. I have never had a problem getting up in the morning when the sun shines through, I wake up. But I now have a job that requires me to get up before the sun. I have always enjoyed the subtle wake up of the sun and nature. It soothes the soul. No one really likes buzzing loud alarm clocks. This is a way where you can wake up with nature and start your day off right! Thanks Glen, I appreciate your kind words. Your are certainly right that Sunrise Alarm Clocks are a much nicer way to wake up than the traditional shrill ringing of a normal alarm. You have nailed it with such an impressive array of Sunrise Simulator alarm clocks. To be quite honest, I never really appreciated the loud noise of alarm clocks. So, I wake up naturally to the sunlight streaming through my window. But. after reading about the Sunrise ,Simulator alarm clock, it could surely give a gentle wake with light! I would love to invest in the Phillip Somnes HF 3650/60 which is the Rolls Royce of wake up light. I love it! Thanks Maxine! The Philips Somneo is a great choice – I love them – they give off a glorious color light and have a great choice of nature noises. I don’t think you will be disappointed if that is what you go for. 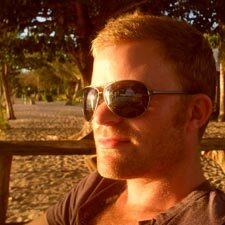 Do all sunrise simulation alarm clocks increase the production of serotonin and reduce the production of melatonin? One of the ways that I am currently increasing the production of serotonin is taking brisk walks in the countryside for about 50 to 60 minutes most days. However I find that this is problematic during the winter months for various reasons. I am now wondering would a sunrise simulation alarm clock help my production of serotonin. As I understand it, there are no tests that determines how much serotonin is actually in your body when you are alive, which is a shame, because it would be good to know, so that corrective actions can be taken, for example, go for longer brisk walks or use a sunrise simulation alarm clock. Which sunrise simulation alarm clock do you use yourself? Yes all good sunrise alarm clocks should increase the production of serotonin and have a positive effect on your mood and energy levels. It is so much nicer to wake up to a sun gradually coming up than a piercing alarm. I actually use the Lumie BodyClock Active, but will very shortly upgrading to the Philips Somneo. A combination of brisk walks and a sunrise simulation alarm clock should set you up well for the forthcoming winter! This sounds incredible. My husband prefers alarms like this. It’s annoying to have a rude awakening by a noisy alarm. I will take a look into this! I am a little confused how the alarms make it easier to fall asleep. Can you please clarify? Also, can these alarms help someone who does the night shift? 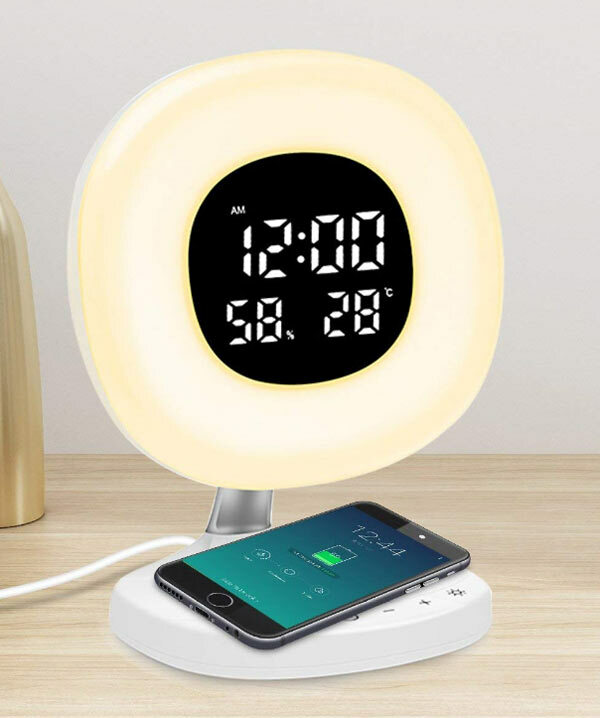 These sunrise clocks also have a sunset feature, that means you can play nature sounds and have the light gradually decrease in brightness to lull you to sleep. They can also help someone on a night shift, although in my experience they always take a toll on you! I hear about the sunrise simulator lamps, but are they the same as the therapy lamps? I like the variety of choices you review, and I decided on a Philips one, but I’m still thinking which one is best HF3510 or HF3520. I really like the design, but hard to choose. I read that you can use them as a bed lamp, is there any setup available to switch it off if you fall asleep? Sunrise Simulator Lamps and Light Therapy lamps are different, but do both help alleviate SAD and give you more energy. Good choices! 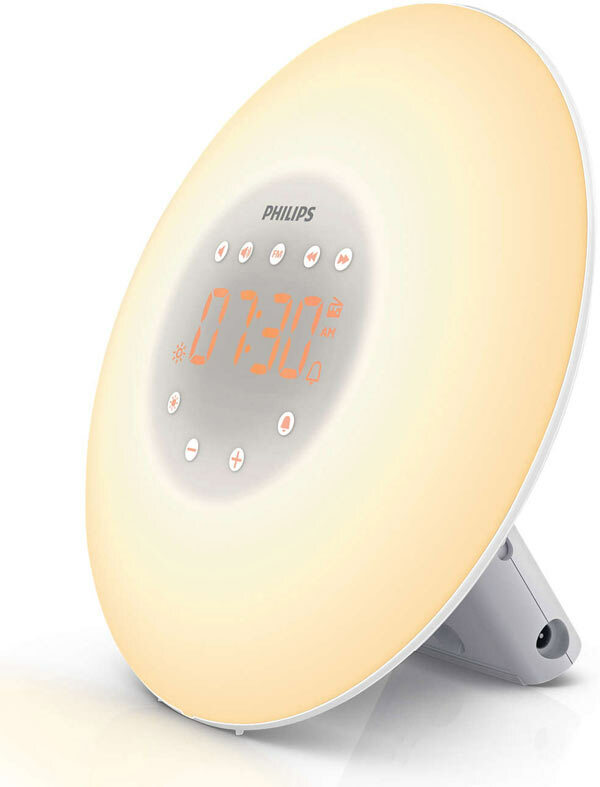 The Philips HF3520 would be my choice of the two – it has a beautiful sunrise simulation. They can be used as bedside lamps, the light will gradually fade until it goes of completely and should help you sleep.